Social media is a constantly changing – especially Facebook. 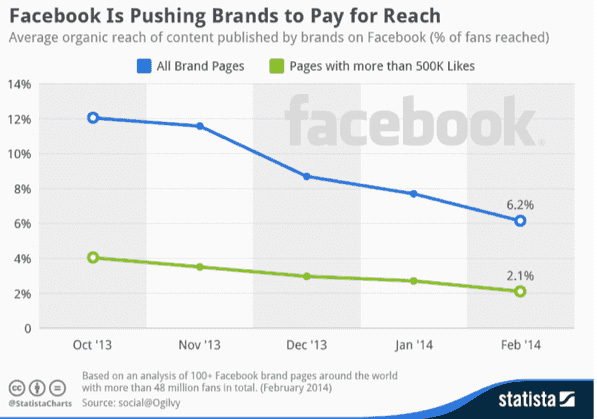 Facebook’s main shift is less organic outreach while leaning more towards paid marketing. This is why many businesses on Facebook may notice the change with how many less people organically interact with their posts. This decline started in October 2013 and February 2014. Organic reach went down to 6%, but if you were a more popular page (500,00 likes or more) it dropped down to 2%. Although this decline happened, it left advertisers with a powerful tool that they never had before. If you think about it, before social media there was TV, print, radio, banner ads, direct mailers, etc. – All of those did not have organic reach, they all needed a budget to reach an audience. Facebook is leaning towards doing the same thing. Get More Leads, Customers & Better Overall Results! At Passinglane, we produce cutting edge, award winning, websites that are optimized and programmed to work using any browser; whether it be on a desktop or mobile device. Our responsive design techniques deliver websites that automatically optimize the layout to fit any screen dimensions. How Choosing the right marketing strategy can make or break your business. Did you know that over 50% of Instagram users follow at least one business?